This has been a bad Christmas and New Year period for on Monday night motor racing photographer John Ross died after a short spell in hospital. His name may be familiar to the older TNF members as he was the Chief Photographer for the original Auto Course quarterly magazine of the early 1950s that was notable for printing full entry lists and results of racing events covered. 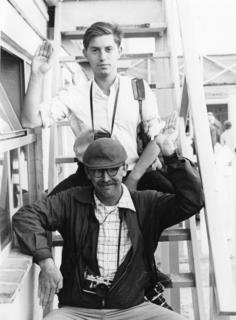 John, who was a commercial photographer mainly doing advertising as well as being one of Britain's best photographers of Ballet. Unlike the rest of us John used to use a Rollieflex twin lens reflex which gave a square picture and it was awkward to handle with panning shots but John was good at it. Not only that but he did a lot of what we would call industrial photography so that h e had photographs taken inside Lotus, Elva, Vanwall and the like which were used in Auto Course and since in many of the big format marque books that have been published. He and I met for the first time in July 1956 at the British Grand Prix. We were both at Club Corner when Tony Brooks drove into the infield with his throttle cable broken. He stopped beside racing driver Mike Anthony who was spectating and Anthony asked if anyone had a pencil which he jammed in the throttle cable and with the help of some spectators push started Tony who went back to the pits with the BRM for a proper repair and on returning to the track had a big accident where the car caught fire and was burned out. In my photo of Mike pushiing the BRM John Ross is in the background with the Rollei and in his photograph from the other side I appear with my trusty Leica. From then on we used to meet up at races from Silverstone to Monza. He was a great friend of Henry Manney III and is godfather to, I think, Henry IV, and in turn Henry was godfather to one of John's sons. His web site is a nice trip down memory lane. Even his ballet photographs are spectacular. So, Tony Brooks should have been disqualified for receiving outside assistance. Or did the BRDC allow it? But, on topic, my condolences to John Ross's family and friends. The vagaries of motor sport. And to get back on topic, my condolences to you, Graham. How old was John? I am not quite sure but I think 86. John was brought from what was then Czechoslovakia to Britain by his uncle Arpad Elfer who was to become one of the finest art directors in London Advertising. John's parents had been killed in what appears to have been a political killing and he never talked about his early life. Glad to see someone posted my photo of John with Tony Brooks because I tend not to post many photos and I have lost the app I used to use to download for web sites . What is the recommended app these days ? It's understandable for anyone that age from those parts of Europe not to be talking about those days. If he came during the war it would have meant traversing difficult circumstances all the way, after the war it meant he'd been through some kind of hell for those years. What a superb motor racing portfolio. So many of them are familiar having been seen and enjoyed over the years without being aware of the source. The images of the reopening Crystal Palace meeting in May 1953 reminded me of what a lovely place it was on that sunny day. So many memories of so many boyhood heroes. My condolences to the family and friends of Mr Ross and my belated thanks to him for his wonderful work over the years. Sorry to read this Graham - as I just this moment have - John was a fine photographer, and a nice chap, indeed. Rarely in period did the photographers get much, if any credit for their work. By a note I made to myself a few years ago, I'm pretty certain it was Graham Gauld's mention of John Ross in the Alfred Woolf thread that made me dig a bit deeper. The website has some wonderful images worth looking through and now a legacy to John's work and skill. Thanks Ray, I was being lazy trying to avoid postimage by copying it over, But as soon as I tried to post the post with it copied in, I got a message that I wasn't allowed to do that. Hopefully someone can (quickly) help for a little project I have. 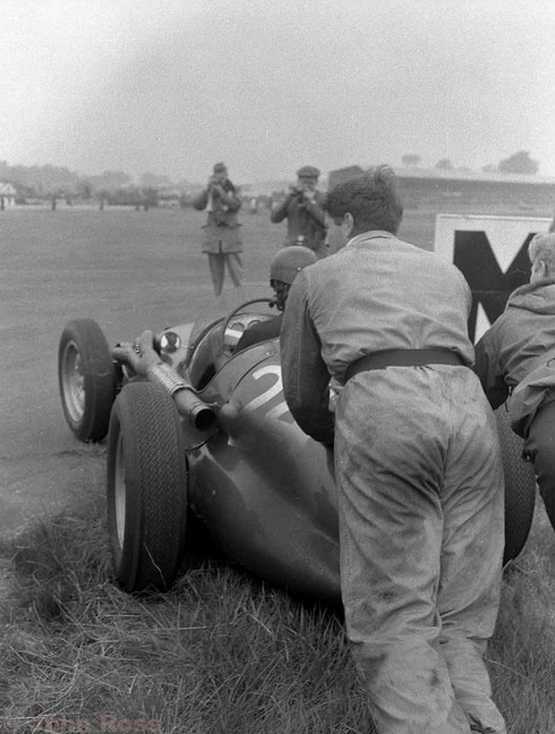 Apart from Graham Gauld's 1956 British GP photo (linked in rewind's post), does anyone here have knowledge of a photo of John Ross please? What a lovely legacy to leave, fantastic images. Many thanks for posting this photo of John and Henry/ I have sent you a message. Thanks. At least his age is given.